The HL Series LED Linear Highbay, a uniquely compact and adaptable high output luminaire for commercial and industrial lighting applications, tops the list of LED products MaxLite unveiled at Lightfair International 2016. Measuring approximately 14” x 24”, the LED luminaire offers leading-edge efficacy and scalability for high ceiling applications such as warehouses, distribution centers, manufacturing facilities and big box retailers. The HL Series highbay is offered in 100-, 150- and 200-watt versions, with outputs starting from 12,000 lumens, to replace traditional fluorescent and HID fixtures of up to 600 watts. In its highest output of 24,000 lumens, the MaxLite luminaire measures almost one-fourth the size of a standard highbay. The HL Series LED Linear Highbay can be configured with narrow or wide lens distributions, as well as emergency controls, for optimal lumen output and energy savings. A variety of cable, pendant and surface mounting accessories enable the highbay to adapt to a wide variety of lighting situations. 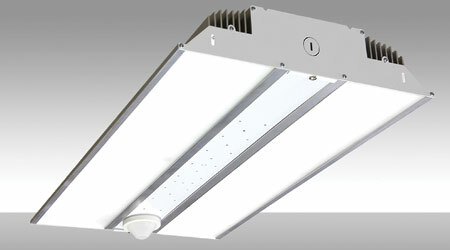 The HL Series highbay is available in 120-277V and 347-480V inputs, and is compatible with 0-10V dimming controls. The HL Series highbay consumes 50 percent less energy than traditional fluorescent and HID luminaires and is built to operate 100,000 hours, providing significant long-term energy and maintenance-cost savings for facilities. The highbay is backed by MaxLite’s five-year limited warranty and lifetime product support.